This will be neat to see. It is one of the great migrations in the world and perhaps one of the most unlikeliest. I grew up with them and even collected pupae to watch them emerge. A real surprise is that a tagged butterfly from Wisconsin made it all the way down to Mexico in one generation. These are amazingly, generational migrations. Fears about this butterflies future are likely misplaced now that the winter refugia is well known and the insects have zero economic value. However poaching suggests that landholder are uncompensated and need to be bought out. Do that and establish a conservatory and the problems will go away. At the same time, the milk weed needs to be cultivated for its natural product stream anyway. Flight of the Butterflies, opening in New York at The American Museum of Natural History on Jan. 5 lets you take a journey with monarch butterflies during their annual migration. Theirs is the longest insect migration, which spans thousands of miles and several generations and took 40 years to uncover. Director Mike Slee co-wrote the script with co-executive producer Wendy MacKeigen to reenact the discovery of a lifetime. They received help from the world's top monarch butterfly experts and major funding from the National Science Foundation. "...This new film allows the audience to experience the natural world of butterflies as never before — in metamorphosis inside a chrysalis, in flight a mile high, migrating over great distances, and in tree-laden monarch sanctuaries," said executive producer Jonathan Barker, the CEO of SK Films in a press release. "In 'Flight of the Butterflies,' we are able to utilize the spectacular giant screen technology to follow an even more fascinating creature — the fragile yet tenacious monarch — and bring to life the compelling detective story and heroic efforts by an intrepid scientist and real individuals to solve a scientific mystery." I was invited to see the movie on Tuesday, December 11, 2012 in IMAX 3D in New York. You have to see this movie to believe it: The film was absolutely stunning and the 3D on the IMAX screen made me feel I was there surrounded by butterflies, flying a mile high on the way from Canada to Mexico. There was such an incredible number of butterflies in some scenes that it was hard to believe none of the butterflies are computer generated. The only computer graphics in the movie was the amazing animation looking into the chrysalis, the hard outer protective layer in which the caterpillar transforms into a butterfly (colloquially known as a cocoon, though those are technically only for species of moths). 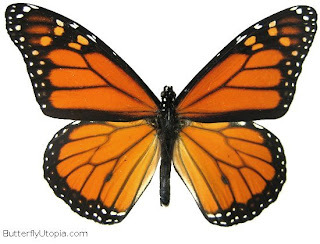 Researchers used special scans to see how the caterpillar changes, including growing wings, long legs, and its organs changing in order to become a butterfly, then computer animated this portion of the film. The butterfly sanctuary in Mexico where the monarch butterflies spend their winter is a truly unbelievable sight. So many monarchs cover the trees, that they appear to be part of them. This docudrama follows the 40 years that Fred Urqhart and his wife Norah Urqhart spent searching for the winter home of the Monarch butterfly. With the help of thousands of volunteers they tagged butterflies from Canada, America, and Mexico. It was two volunteers in Mexico, Ken Brugger and Catalina Aquado, who discovered the monarch's winter home in 1976: A butterfly sanctuary in the 10,000-feet-high Sierra Madre Mountains of Mexico. Actress Stephanie Sigman playing Catalina Aguado replicates the famous picture on the cover of National Geographic. When Nora and Fred visited the sanctuary they find a monarch, PS397, which was tagged by two school boys and their teacher in Minnesota, 2,000 miles away, four months before. National Geographic featured the discovery of the Mexican sanctuary in their August 1976 issue with a picture of Catalina Aquado surrounded by butterflies on and around her on the front cover. In the movie actress Stephanie Sigman recreates that scene. Thanks to the movie the butterfly sanctuary was declared a World Heritage Site by the United Nations Educational, Scientific, and Cultural Organization. But, the World Wildlife Fund reports that the butterfly population in the sanctuary has dropped one third since 2011 due to illegal logging, industrial farming, and climate change. The monarchs are now classified as near threatened. A significant amount of the box office revenue will go towards protecting the butterfly sanctuary. Largest Structure in Universe Discovered? Was There a Church in Mecca? Tobacco Can be Cancer Free?